The U.S. economy runs on its infrastructure. From roads, railways, ports, and airports to drinking water, waterways, and wastewater, the country relies on a web of interconnecting infrastructure systems. Unfortunately, the United States faces an infrastructure crisis. Many critical facilities are no longer useful or are in need of major repair or replacement. 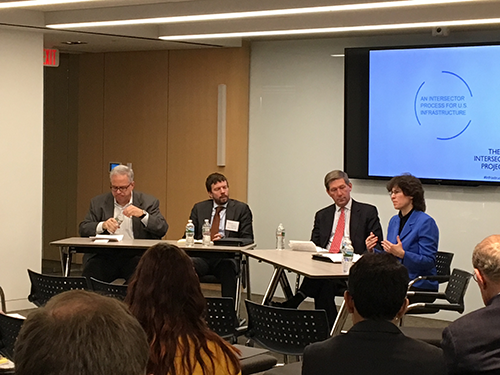 To address these needs, stakeholders from across the government, business, and non-profit sectors joined The Intersector Project to discuss a collaborative approach to solving U.S. infrastructure problems. Among the attendees was Rep. John Delaney (D-MD) who provided the keynote address. He delivered expert perspective, thoughtful commentary, and valuable insight into the role of infrastructure in American life. Brian Pallasch, Managing Director of Government Relations and Infrastructure Initiatives at the American Society of Civil Engineers, helped frame the key issues by discussing the significant backlog of overdue maintenance across U.S. infrastructure systems and the need to make investments to move projects forward. Dan Vock, Transportation and Infrastructure Reporter for Governing, moderated the first panel discussion with Nicholas Donohue, Deputy Secretary of the Virginia Department of Transportation; Caitlin Durkovich, Assistant Secretary, Infrastructure Protection, National Protection and Programs Directorate for the Department of Homeland Security; Marcia Hale, President of Building America’s Future; Erik Hansen, Senior Director of Domestic Policy for the U.S. Travel Association; and David Parkhurst, General Counsel at the National Governors Association. The panel explored differences, common ground, and potential for collaboration among sectors working on infrastructure. During the program, Neil Britto, Executive Director of The Intersector Project, and Peter Peyser, Principal of Peyser Associates presented the issues roadmap, “Key Intersectoral Issues in U.S. Infrastructure,” which presents the critical issues — as identified by collected experts across the business, government, and non-profit sectors — that need to be resolved to move U.S. infrastructure forward. View the full issue document here. A second panel discussion focused on reactions to the issues roadmap and was moderated by Dan Carol, Senior Advisor at Georgetown’s Beeck Center for Social Impact and Innovation, and former inaugural President of the West Coast Infrastructure Exchange. Mayor Patrick Wojahn of College Park, MD, joined members of SIFMA, Capitol Peak Asset Management, and the Bipartisan Policy Center to provide reactions and to discuss next steps. Finishing the morning, Frank Weil, Chairman of The Intersector Project provided some final thoughts and closing remarks. The Intersector Project plans to continue discussions and identifying cross-sector solutions to infrastructure issues. See the Twitter discussion from the event in this Storify.